"Previously released as four separate novellas, The Suprahuman Secret by author Milo James Fowler details the case files of Private Detective Charlie Madison in one convenient tome. Although the main action takes place in a future world where automatons known as mandroids are deployed to fight wars, and most everyone has a handy LinkCom either implanted or mobile, there is still a hint of the classic noir that harkens back to Bogey’s Sam Spade movies. "Charlie Madison is probably the last remaining Private Detective in his Russian-controlled corner of the world. (Isn’t it amazing that after everything and with all human advancements, organized crime still manages to survive?) After the “great diaspora,” the Eastern Conglomerate has pretty much taken major portions of the world. With immigrants and refugees flooding into the Unified States, the area sees a fundamental change is its ethnic make-up with the Russians owning the landscape and the Asians relegated to hastily constructed slums and settlements in the outskirts of major urban areas. With the various nations of the planet competing for supremacy, all manner of shady dealing is tolerated if the means justifies the ends. "Reading through this series, I found myself transported to a world that was part Terminator and part Maltese Falcon. Charlie is the classic gumshoe living out of his office with Wanda as his femme fatale assistant and loyal confidant. It is very easy to picture Charlie with a classic fedora reminiscent of Humphrey Bogart, and I do believe I caught a smidgen of a Casablanca reference a time or two as well. Wanda, as his Girl Friday, is the typical blonde bombshell, but underneath that pretty exterior is a smart gal with an aptitude for navigating the current tech that their world is saturated with. "Charlie’s world is the acid rain-ridden ruin of a California town in a post-war world where nations fight for dominance, organized crime is alive and well, and if you are Anglo you do not want to be caught in Little Tokyo after dark. Fowler’s balancing of the old and new serves this series well, with the old not seeming outdated and the new not feeling too futuristic. Having read all four books in the space of a few days, I did notice a little bit of repetition with certain descriptions; however, keeping in mind that these were previously separate releases over several years, this did not bother me. Rather it served to reinforce the world where the action takes place. Also, while all novellas work together to tell a larger story, they also work as stand-alone offerings. Fowler is currently working on the fifth and final installment in this series called The Gifted Ones, and I for one will be waiting to catch up with Charlie again for another Case Closed. 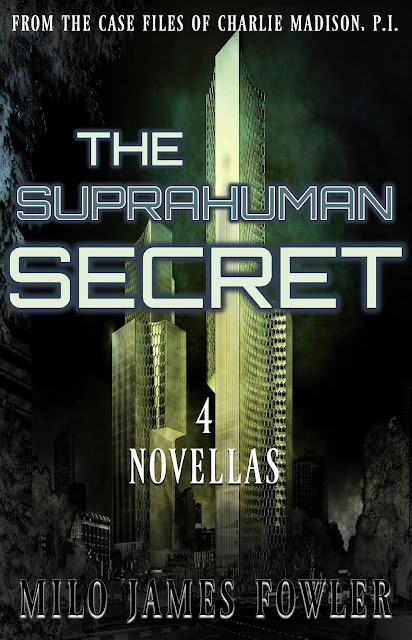 "If you are a fan of noir, science fiction, dystopian or fantasy, you may want to give The Suprahuman Secret a read. You will not be disappointed!"